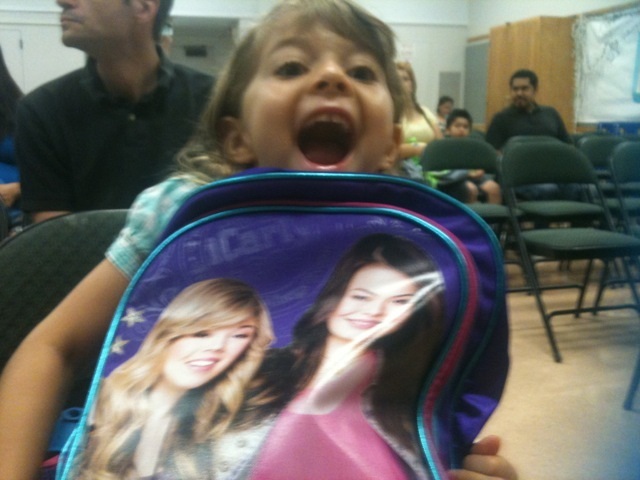 Sure, starting Kindergarten is great but not quite as awesome as wearing my mom down to get this iCarly backpack. . Don’t know if she’s excited about starting school or that she wore me down to get that iCarly backpack. Yesterday was my first day of kindergarten. What was the best part you ask? My new school has an entire bathroom filled with TINY TOILETS! Stalls and everything!! Truly awe-inspiring. The worst part? I think you know. If my mom’s behavior surrounding my education is any indication of things to come I. Am. Screwed. She’s been a wreck. You should’ve seen her the night before, freaking out that I “have to get a good nights sleep! !” How the hell am I supposed to get any R.E.M. slumber with you stressing me out?! I’d pop an Ambien if I knew what one was. When I woke up in the morning she was hovering over me like a maternal lunatic (wait is that redundant?) The first words out of her mouth? “You can’t start kindergarten on an empty stomach. YOU HAVE TO HAVE A GOOD BREAKFAST!!! !” Get a grip woman, you’re almost putting me off my Trader Joe’s Strawberry Yogurt O’s. Walking to my new school wasn’t any better… it was like being followed by the freaking paparazzi. She couldn’t stop taking pictures. I felt like doing a “Sean Penn” on her and trashing her camera but since her camera is on her iphone which houses my favorite aps, Cake Doodle and Super Why, I restrained myself. I’m no fool. When I finally got out of her cloying clutches I happily lined up with my fellow kinders ready to finally be grown up. I look up and what do I see? My mom blubbering like a giant baby. FYI, I have the same attitude about babies that Madonna has about hydrangeas. I loathe babies. What? Just me? Tags: back to school, elementary school, kindergarten, school | Permalink. I’m sure your mom acted no better after school that day. She should probably read my list of What Not to Do when your kid is starting school. Thanks Summer I’ll pass it on to her! Congrats on your first day of freedom. I have a Lilly too and I believe she feels the same way you do. She is in 8th grade and I still take a first day of school class picture and a end of school year class picture. I guess I should stop in High School. Your mother is an annoying shrew, Lily. You’re so lucky you can get a few hours away from her every day. Mr. Spark, you don’t know the half of it. That was funny. Especially the hydrangeas! I liked the “going Sean Penn on her (trashing the camera)” idea. I am trying to get my hands on my folks camera and – oh, boy – this is going to happen one day.